In a recruitment film released today, easyJet have reimagined a famous scene from Hollywood movie Catch Me If You Can. Leading the cast was nine-year-old Hannah Revie, the daughter of real easyJet captain Emily Revie. 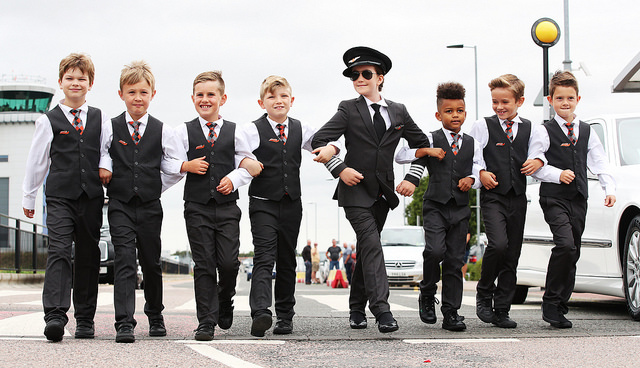 In the short film Hannah adopted Leonardo DiCaprio’s swagger in full easyJet uniform and was flanked by an entourage of boys, playing the role of the cabin crew, aptly played by children of easyJet staff, to inspire young girls to pursue a pilot career. By re-shooting the movie scene easyJet hopes to course-correct notions forwarded by Hollywood movies like Top Gun, The Aviator and Flyboys that being a pilot is a man’s job. The campaign was grounded in the findings of new research which found that childhood role models are vital to inspiring young people to consider a piloting career. easyJet has set a target for 20% of new pilots joining the airline to be women by 2020 at a time when only 5% of all pilots worldwide are female, as benchmarked by the International Society of Women Airline Pilots. One comment on easyJet launch campaign to inspire more girls to become airline pilots. A new age of sexist ads and discrimination for boys/men why would all the boys want to be cabin crew its going from one extreme to an other.